King’s College London is one of Europe’s largest institutions for research in the fields of developmental neuroscience and psychiatry, producing more highly cited publications in psychiatry and mental health than any other university in the world (Scopus 2016). Building on the outstanding clinical and basic science research base, the MRC Centre for Neurodevelopmental Disorders incorporates internationally renowned researchers in this arena, drawn from different departments across King’s. 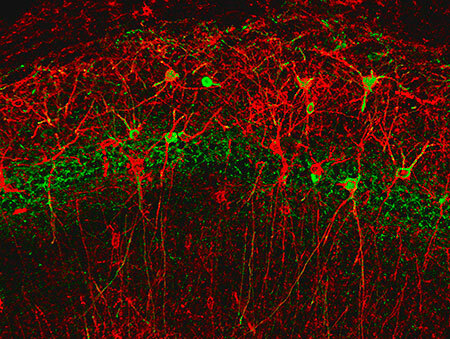 This prestigious 1+3 MRes/PhD programme in Neurodevelopmental Disorders, funded by the Medical Research Council and the Sackler Institute for Translational Neurodevelopment, has been designed to equip a new generation of basic and clinical scientists with the skills to work with each other at the forefront of research into these disorders. In the Centre you will find a unique combination of neuroscientists and clinical researchers working on developmental disorders of the brain, with a focus on autism, epilepsy and schizophrenia. This collaboration between scientists, neurologists and psychiatrists will provide the best possible environment for you to train and become part of the next generation of world leaders in this field. You will have the opportunity to be based in one of three central London sites, and will be part of an exciting and vibrant university and city. The 4 year PhD Programme in Neurodevelopmental Disorders has a 1+3 structure, where the pivotal first year allows for a fully informed choice of doctoral project, as well as developing breadth and depth of knowledge in Developmental Neuroscience, and acquiring the general skills required for a successful PhD. The first year of the 4-year PhD programme comprises the MRes in Neurodevelopmental Disorders course. Its major focus is three laboratory rotations, designed to give students a broad experience of research opportunities across King’s, with training in laboratory techniques and scientific communication to a range of audiences. In addition, students will benefit from a taught Neurodevelopmental disorders module covering topics from basic principles to the latest research, as well as interdisciplinary and transferable skills training. Based on their experience in the three different laboratory rotations, students then choose their PhD supervisor and project at the end of the first year. For details of potential supervisors please see the tab "What kind of projects?" on this page. During years 2-4 students will work full-time towards the completion of a research Thesis in Developmental Neurobiology. To complement their research training, students also have access to a wide variety of transferable skills and networking opportunities across the wider neuroscience community. This includes the opportunity to undertake short-term placements in a network of collaborator laboratories elsewhere in the UK and in the US. This network includes David Amaral (UC Davis), Mark Cunningham (Newcastle University), Daniel Geschwind (UC Los Angeles), Paul Harrison (Oxford University), David Lewis (University of Pittsburgh), and Nenad Sestan (Yale University). There is a dedicated PhD committee, with members drawn from across the different research topics within the Centre that will monitor the training of students. In addition, each student will have an individual Thesis Committee that will provide tailored scientific input and support. Students will be integrated into the large and thriving PhD community at King’s with the opportunity to participate in an immense variety of scientific and social events. Contribution towards research costs, training and conference attendance. If you want to know more about postgraduate opportunities at the MRC CNDD, please contact the Training Coordinators Dr Laura Andreae and Dr Anthony Vernon. We are keen to attract individuals from a variety of backgrounds, and encourage applications from both biological and physical sciences, including clinicians, , mathematicians and computer scientists. Applicants should have, or expect to achieve, at least a 2:1 degree. If applicants possess a lower second class (2:2) then a research-based MSc at merit or distinction level is required. English language competence criteria apply. At King’s, we are deeply committed to making the university an inclusive, welcoming and inspiring place to work and study. We encourage and welcome applications from across the community and all appointments are made solely on merit. The MRC provides a stipend and PhD registration fees at UK/EU student rate, research expenses and a contribution towards travel. The MRC does not pay fees at the overseas rate. Applicants must meet UK residency requirement. Please check your eligibility on the MRC website. PhD projects will be typically supervised by two scientists in the Centre, most typically a neuroscientist and a clinical scientist. These are examples of indicative projects for the academic year 19/20. Dafnis Batalle, Grainne McAlonan, David Edwards The vulnerable brain. Using neonatal MRI brain structural and functional connectivity to predict autism spectrum phenotypes in childhood. On the ‘Choosing a programme’ page, please enter the following programme name ‘Neurodevelopmental Disorders MRes’ and search. A personal statement describing your interests and why you wish to apply for this project. Please include this as an attachment rather than using the text box. Academic References – all admissions applications require two supporting references. If the applicant is relying on his/her referees to submit references directly to the College after he/she has submitted his/her admissions application, then the applicant must ensure that their chosen referees are made aware of the application closing date. Please note there is no need to complete the Research Proposal section in your application as the project has already been set. References must be received by the deadline for the applicant to be eligible.